A young Canadian nurse working in the NHS in Scotland for 6 months. An Austrian scientist, currently living in Australia but in the UK for a one month research visit. A German born British solicitor, educated in the UK and Germany and working in Lancashire. Myself, a British born engineer living and working in Yorkshire, but also an Australian passport holder. We visited some spectacular spots on our subterranean journey. But we were also a microcosm of the global world in which we find ourselves. We can’t escape that globalisation, it is all around us. However, some people and some politicians seem keen to turn our backs on the world, to make the UK a more insular, inward looking kind of place. You can see this trend very clearly post the Brexit referendum. There are reports of increased racist abuse and attacks on foreigners or foreign businesses. In fact it seems that the result of the referendum has made xenophobia an acceptable position. It is no secret that I am a “remainer”, but even if I am in the minority here, surely we can leave the EU without a moral slide into fear and hatred of anyone who is not “like us”. The EU is a political and economic organisation; leaving its institutions doesn’t have to mean turning our back on the world and the diverse people that make that world such an interesting place. I have a number of serious problems with the current anti-foreigner theme running through society. My first point is just practical. I am an engineer. The branch of engineering I work in – how civil engineering structures are supported by the ground – has been on the government skills shortage list for well over a decade. This means that non EU workers can obtain visas for jobs in this field because it is not possible to fill all the vacancies with EU workers, let alone only UK workers. These jobs are essential to the success of our country. These types of engineer are currently building Crossrail to ease congestion in London, they are maintaining our roads and railways, our sewerage systems and drinking water supplies as well as making sure that our built environment is indeed built on solid foundations. 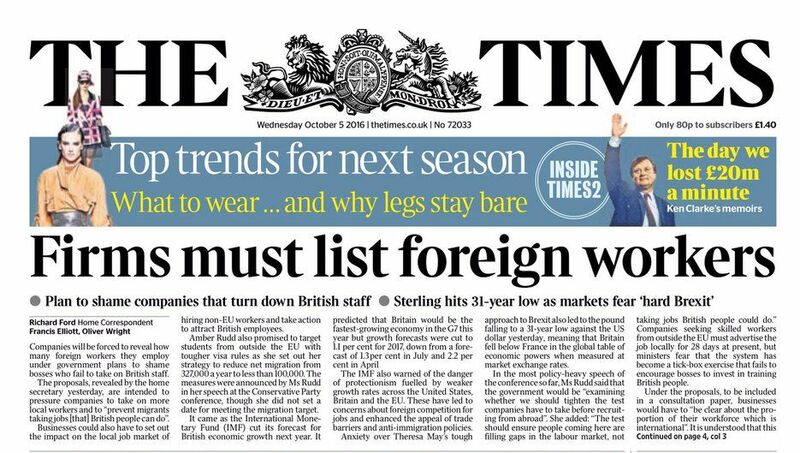 Who is going to do these jobs when “foreign workers” are excluded? Or the ones that are here already decide they don’t want to live in such a divisive country any more? Then there are the human and moral points. These “foreign workers” are all people. Were my companions at the weekend my friends or were they “foreign workers” to be despised? Working with and sharing friendships with a diversity of people has enriched my life for the past twenty years; it has given me insights into other cultures and other politics. Listing foreign workers is just a small step away from marking out the Jews, from discriminating openly against the Palestinians, from mob rule, from gulags and concentration camps. Did our politicians and our journalist not do history at school? You might suggest I am over reacting here, but all the nasty things that happened in Europe in the 1930’s and 1940’s started in just this way with the kind of rhetoric we are hearing from UK (and also certain American) politicians now. If we start treating people with disrespect just because they are different (be that “foreign”, homosexual, Muslim, female, ginger or any trait) we are marching towards a humanitarian disaster. I want to live in a better world than this. In fact I want my country back. My tolerant, understanding, fair, welcoming country. A country that used to accept refugees fleeing war and persecution. A diverse Britain which saw no contradiction between having both the Sunday roast and chicken tikka masala as its national dishes.